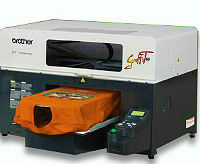 This machine sets the standard for state-of-the-art sewing, quilting, crafting and embroidery. With a large working space, you'll create wonderful embroidery projects using over 670 built-in embroidery designs. Another great feature is the enhanced on-screen auto resizing of designs. It's time to realize your creative artistry with the Quattro 6700D. The NX450Q features a variety of quilting stitches and sewing accessories. It comes with a quilting table for added support as well as a knee lifter for easy fabric control. The large extension table expands your sewing work area, has convenient built-in rules, plus it's adjustable! All of these features make sewing and quilting more enjoyable. This machine enhances your creative potential . Beginners will appreciate the free-motion stitching and quick-set bobbin which prevents top bobbin jam. Comes with a built-in automatic needle threading system so you can focus on what really matters in your sewing adventures! Features a wide array of decorative stitches and convenient machine features. Made by Brother, powered by your imagination! Innovation, creativity, productivity and expansive space make the innovative Entrepreneur® Pro PR-1000 a must-have! 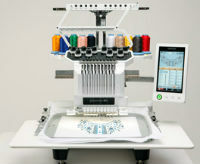 This 10-needle home embroidery machine, raises the bar in embroidery for hobbyists, crafters and home-based entrepreneurs, Features InnovaChrome™ Thread Color System, InnovEye® technology, and much more. 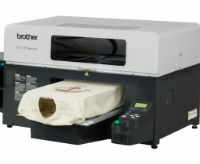 This all-in-one, direct to garment printer from Brother can print CMYK at 1200 dpi photographic resolution, providing the fastest printing possible. 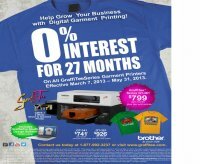 A comprehensive solution to garment printing, costing far less than other direct to garment printers but offering superior detail, quality, and speed. 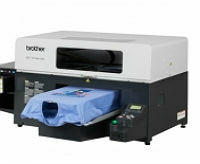 Designed with customer feedback in mind, using over five years research with garment printers, the new GraffiTee™ This digital garment printer delivers a suite of advanced features to accommodate all your garment printing needs.With one-pass printing, a compact size and simple user interface, this garment printer offers quality printing and high productivity.